Betting on the outcome of the lottery, as opposed to buying tickets in the draw is becoming more popular thanks to the unique company Lottoland. Now betting sites are offering the service, so you can bet on lotteries all around the world via the one account. Planet Lottery is a result of a partnership between bookmaker William Hill and lottery giant Lottoland. Both companies have parent companies in the UK/Europe and are licensed in the Northern Territory. The product uses Lottoland’s service to allow punters to bet on lottery draws from all around the world via the William Hill betting site. You can use your favourite numbers – birthdays, anniversaries, etc., – the same way you would when buying a ticket for an official lottery draw. The difference is you are betting on the outcome of the draw, instead of entering it. When you do place a bet at the William Hill bookmaker site – you can do so on your smartphone, tablet, desktop or laptop – you will be betting on the outcome of the draw and the betting site, which is the acting agent, will pass your lottery bet to Lottoland Australia. You are not required to open an account with Lottoland. 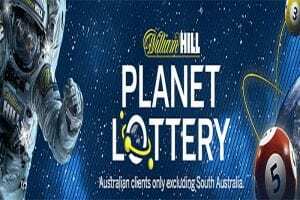 Planet Lottery is available on the Australian William Hill site and therefore open to Aussie punters. Unfortunately, South Australian bettors miss out since it is illegal to bet on the outcome of a lottery in the state under the SA Lottery and Gaming Act 1936. The rest of Australia can open an account via the William Hill online betting site and access the range of lotteries from around the world. Simply create an account with William Hill via the homepage – if you don’t have one already, it takes a few minutes to open an account by entering your details. Then head to the Planet Lottery page by clicking on the option on the left-hand menu panel. The available lotteries, which you will also find at Lottoland, include lottery draws from around the world – US Powerball, EuroMillions, Italy’s SuperEnalotto, and more. Pick from the various options available and click on your numbers inside the grid. Then click the “Place Bet” button on the bottom right to complete your bet. You will be able to make a deposit if you do not have sufficient funds in your account here too. Once you have made the bet, wait until the draw is over and visit the ‘My Bets’ section on the Planet Lottery page. The result will be indicated and winnings will be paid accordingly. Planet Lottery works similarly to Lottoland in terms of winnings. Punters will be paid by the bookmaker instead of pocketing the draw winnings. So if your bet is correct in terms of the draw result William Hill will pay the winnings to your account – you don’t win the money from the lottery draw but you win the same amount as the prize pool you’re betting on. These winnings will be credited to your online bookmaker betting account provided the winnings are under $100,000. If the winnings are above $100,000 you will be contacted by a William Hill representative to arrange when and how you will receive the money. The terms and conditions are available under the lottery options on the Planet Lottery page – we recommend reading these before placing any bets. They mirror the terms and conditions set out on Lottoland’s page too. Any winnings you are credited can be used for further lottery bets or you can use the money to bet on other markets such as sports or racing options via the William Hill desktop site or on the iPhone or Android app. Do other online bookmakers offer lotto betting? Sportsbet offers its own version of lottery betting accessible from desktop and mobile devices. The available markets have been created by the bookmaker and instead of acting as an agent and passing the bets onto another operator, it handles the options. The markets open are only available for international lotteries including US Powerball. There’s also a number of betting markets available for the draws including first, second, third, fourth, fifth, sixth, or seventh Ball to be Drawn, First Ball Drawn Odd/Even, First Ball Range, Pick the Supplementary Numbers, Number of the Powerball, and Powerball Odd/Even. Ladbrokes has the betting option listed, but no available markets are open yet. We will update this page as they become available.